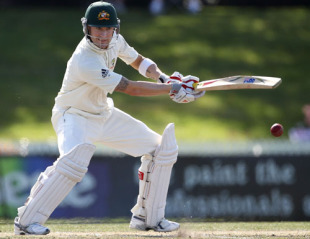 Michael Clarke's increasing seniority within the Test team is set to continue with his likely promotion to No. 4 during the series against Pakistan in England. As the vice-captain, Clarke is being groomed to take over the leadership whenever Ricky Ponting retires and over the past year he has shouldered that responsibility by being Australia's leading run scorer with 1171 at 65.05. While Clarke's form has been outstanding at No. 5, the No. 4 Michael Hussey had a tougher year, although he lifted his output during the home summer. The Australians are already looking towards next season's Ashes series and after beating New Zealand 2-0, Ponting said he had been pondering whether the in-form Clark would be more valuable up the order. "It's something I've been thinking about this week, to tell you the truth," Ponting said. "He's handled a lot of situations particularly well the last couple of years and in most conditions. There are a few other little things we think about as well as far as the placements in the batting order is concerned but Michael is doing everything right to get up the order, certainly one more spot, anyway." Clarke was one of Australia's best during the Ashes tour last year and they will be reluctant to shuffle the order during their battle to regain the urn. The only Tests remaining before the Gabba opener against England are two against Pakistan in July, and Ponting said that would be the best time to trial Clarke at No. 4. "We'll see what happens in England and certainly leading into the Ashes series," Ponting said. "He probably has been our best and most consistent player with Simon Katich so we'll definitely have a look into that. The next games we play are against Pakistan and we obviously don't want to be making moves like that on the eve of the Ashes so if we do it, that would be a good time to do it." Clarke showed his focus with a career-best 168 in Wellington after flying home to deal with his relationship with Lara Bingle. He finished the tour second only to Katich on the run tally, with 259 at 86.33, and in a month will be heading to the Caribbean to captain Australia in the World Twenty20.